I am very pleased to announce that my story, “O What Freedom, This Great Steel Cage” has made the list of Notable Stories in The Best American Science Fiction and Fantasy 2017! It’s not EXACTLY the same as being chosen as one of the year’s best, but it does mean the editors thought that my story was one of the best 40 science fiction stories produced in 2016. In fact, as I am writing this, I am realizing that my story is the only story from Analog that made the list. I…literally cannot even process that. It makes my knees weak. New story in this month’s Analog! 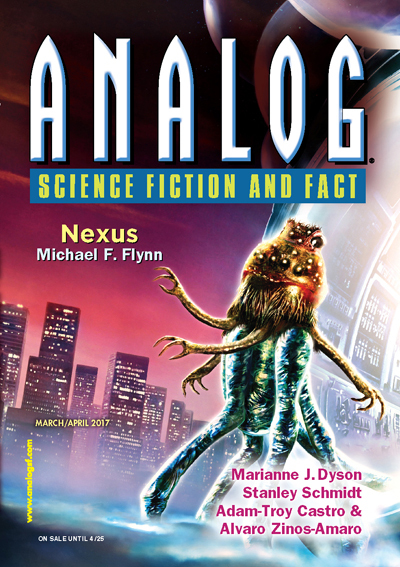 I am happy to announce my story “Alexander’s Theory of Special Relativity”is available in the current (March/April) issue of Analog. I wrote this story just before Alex was born, so you can see that I had the name on my mind. 🙂 This is my third (third!) appearance in Analog, which is something I still can’t believe. This story is about time travel, but mostly it’s about how sometimes people in a relationship change at different rates, and how sometimes they’re not quite in the same inertial frame of reference. This story is not available online, but the double issue can be purchased at many fine bookstores and newsstands around the country. My flash story, “O What Freedom, This Great Steel Cage” is in the May issue of Analog, on sale at fine newsstands now. I want to point out Ian Creasey‘s name on the cover there. This is significant to me personally because years ago, I used to subscribe to a couple of magazines, including Asimov’s. Alas, I had to stop subscribing when I realized that I just wasn’t keeping up with my subscriptions. That stack of unread magazines has sat by my bed ever since, and the one on the top of the stack is the August 2010 issue of Asimov’s. For SIX YEARS I have stared at the cover of that magazine, the contents seeping into my brain by osmosis as I slept. SIX YEARS of staring at those names, including (you guessed it) Ian Creasey. Very happy to be once again appearing in such a prestigious magazine, and to be sharing a table of contents with Ian. I am extremely pleased to announce that I will once again be gracing the page of Analog magazine, with my story “O What Freedom, This Great Steel Cage”. This is a story about how technology plays a role in disability, anxiety, and addiction, which is a lot to pack into a very, very short story. I originally wrote this piece for the Art & Words show. It was inspired by “The Wheel” by Stephen Daly. (Also: story may contain robots). I have a couple of stories out recently, and since (probably) don’t google me quite as obsessively as *I* google me, I thought I might bring them to your attention. 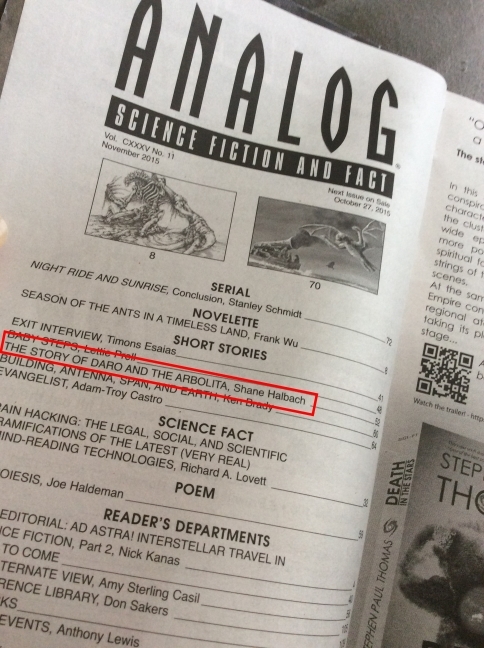 First up, I had “The Story of Daro and the Arbolita” in the November issue of Analog. Shane Halbach is a new writer to me. He shows promise in “The Story of Daro and the Arbolita” by his use of stories within the alien culture he creates. A man driving a futuristic big rig on an alien planet crashes into some trees in order to avoid killing a native. Due to this, Daro is put on trial for killing the trees. The society is very lightly sketched and the trial involves telling stories to remind the judge of certain truths. It is an interesting idea but too fleeting a glimpse to be very memorable. So he wants more from me. Got it. Editors take note. “Daro is driving a “suspensor tug” towing a flatbed through a narrow road on the planet Tillal when he sees one of the native arbolita lying on the road in front of him. To save her life, he lets loose the flatbed which destroys several of the sacred margalo trees. He finds himself on trial for his life and must tell a good story to get out of it. Nicely done. On planet Tillal, the Arbolita practically worship their margolo trees, and killing one is a crime–even to save a life. This is essentially a courtroom drama, even though it’s a very alien court. The hapless public defender makes for good comic relief. The idea of defending oneself by telling a story is interesting. The story is light enough that we don’t get deeply emotionally involved, although the scene at the very end where the Arbolita Daro saved peeks at him before he goes comes close. This one might not be as Halloween-themed as some of the other ones, but it certainly is a lot of damn fun. Calling to mind older sword and sorcery fantasy stories, it involves a dwarf, a heist, and a dragon. And I’m not going to lie, this one reads an awful lot like a D&D session, but that’s never really bothered me. It reads like a really fun D&D session, filled with fun characters and people doing their best to find the weakness of a tough opponent and find a way to bend a few rules. In any fantasy where there’s a rather rigid magic system, there are situations where things can be interpreted rather loosely. And here things get a bit clever as Delevan, the dwarf, and his fellow thieves seek to filch a whole lot of coin from a powerful dragon. There is a bit of back-story as the characters argue before agreeing to team up, and a lot of banter as things go from bad to worse to everything-was-fine-from-the-start. The characterization might not be incredibly deep, but sometimes that’s not the point. Sometimes the point is seeing people get eaten by a dragon and live to tell about it. Fast and with a delightful and rather grumpy voice, the story does what it sets out to do: to entertain. Job well done. Coming Soon – Me! In Analog! Way back in February, I announced that I sold a story to Analog. Looks like I will be appearing in the November issue (which means it goes on sale in October, which means my contributor copies will be arriving in September…publishing is weird). Guess what came in the mail this week? ?